Ever since the boys heard that a young boy in the audience at one of the school concerts in Melbourne described KSB as "Majestically epic" that has become this tour's highest praise. If it had ended with how great breakfast was at the hostel, it sill would have been an awesome day. These guys really know what it means to feed a gang of boys. 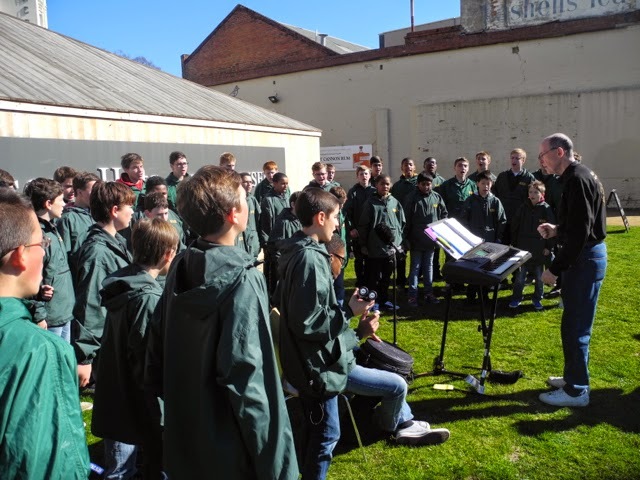 After some time for exploring the water front here in Hobart, we gathered at Mawson's Hut Replica Museum for a mini-concert, and were swarmed with media! 2 TV channels! 2 Radio stations! and the Newspaper. 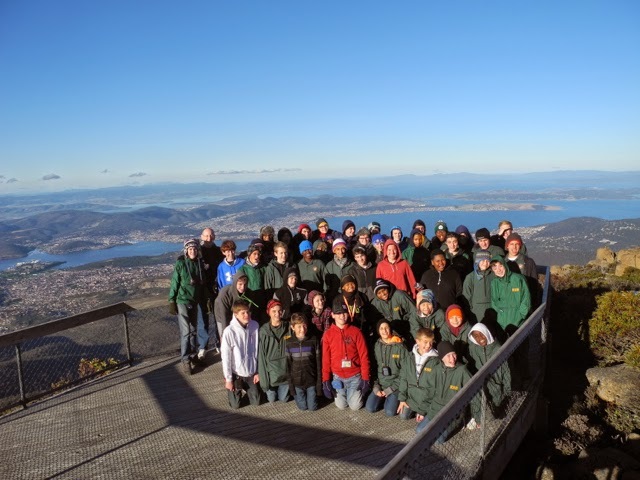 The word was out that a boychoir that had performed in Antarctica was in town, and since there's nothing south of Tasmania EXCEPT Antarctica, it was news. Antarctica behind us (while also being ahead of us) we made a stop at South Hobart Primary School for a short concert. The kids had been celebrating book week and were dressed like their favorite character. 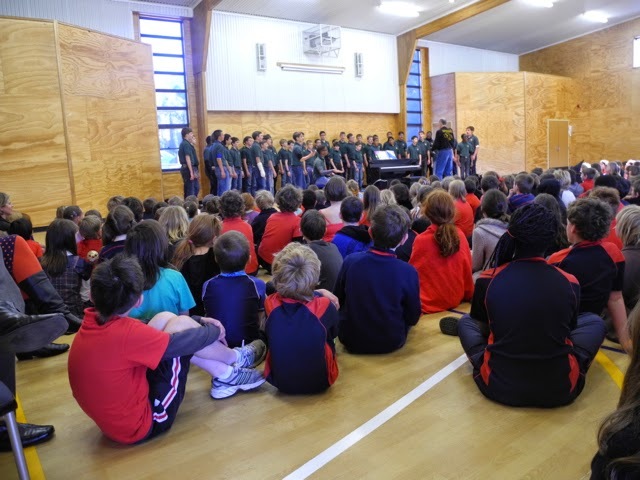 A group of them were so excited when the boys sang The Children's March from Carmen because they had been in a performance of Bizet's opera in Melbourne last year. Fun! 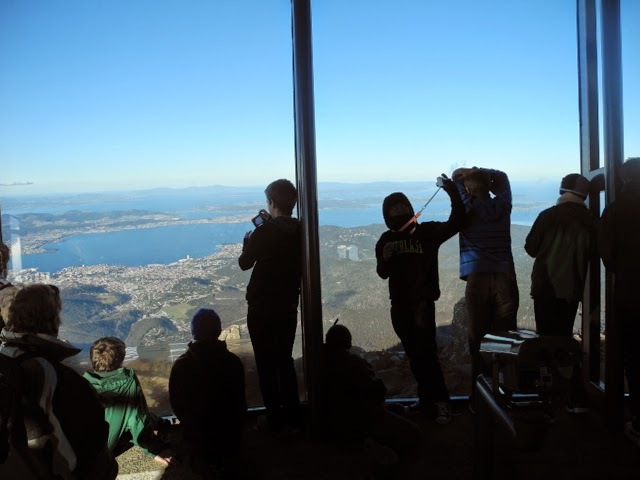 From there, we drove the top of Mt Wellington, a mountain that forms the backdrop for Hobart. There's a small being pavilion that dwarfs the Kimmel Center, so of course the boys had to sing Da Pacem Domine and Tallis Canon for the stunning scenery. Next stop, Bonarong Wildlife preserve. 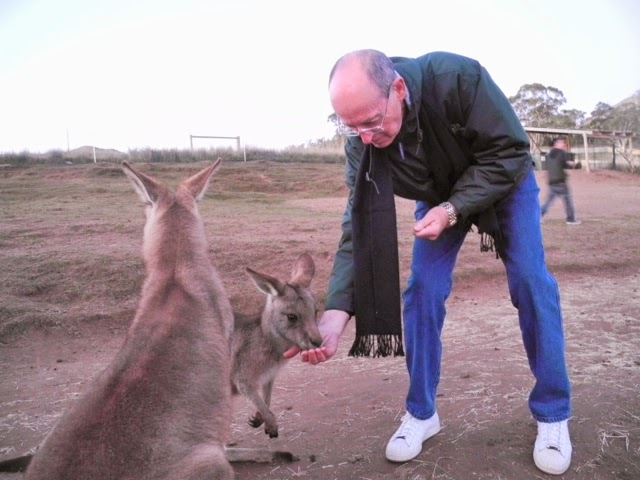 Our awesome guides, Jason and Bob took us out to the Kangaroo pasture and we all petted fed and hung out with the kangaroos there. 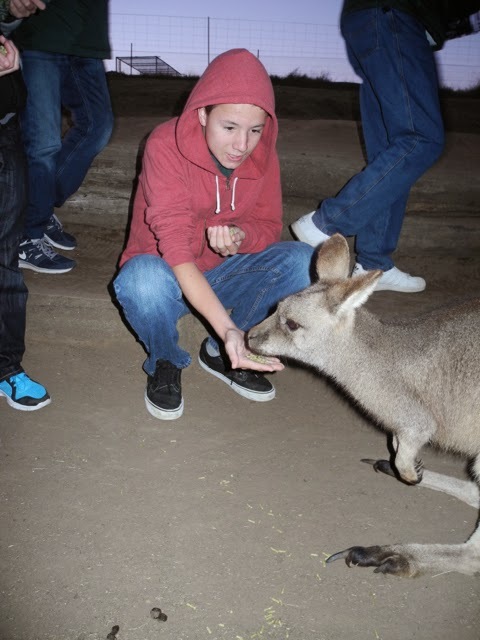 So incredible to be that close to Kangaroos! From there we walked through several animal enclaves as the animals were being fed. 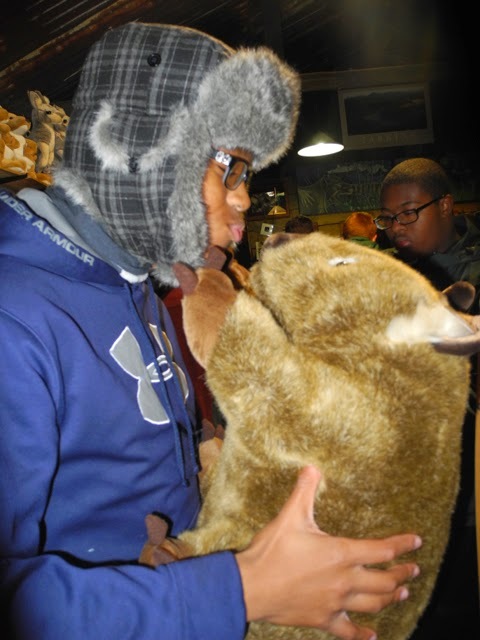 We petted Koalas, and watched Tasmanian Devils being fed. Watching a wombat run is hilarious! 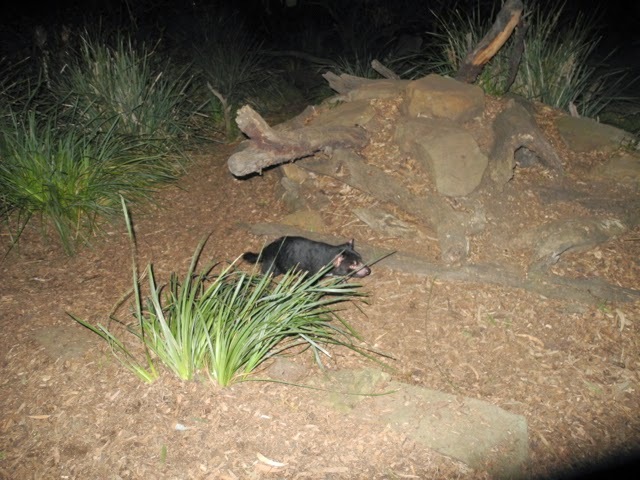 There were a dozen or more other animals -- quoll, bettong, pademelon and more animals that we had never heard of! Thanks to all the families who supported this awesome adventure! 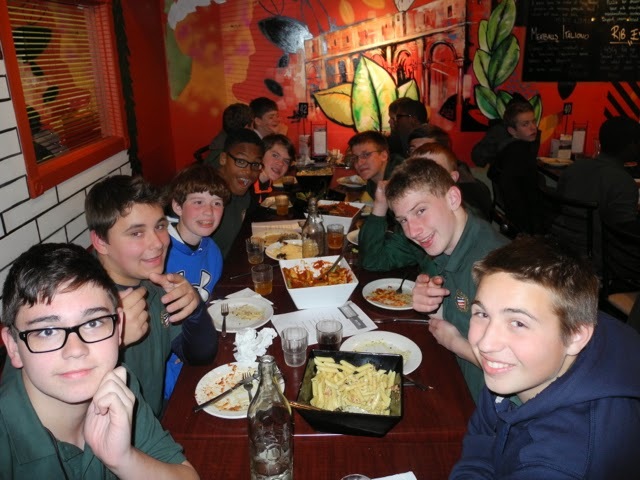 Our day ended with a pasta feast -- nothing like great meals to begin and end a day on tour! PS - this just made the chaps and staff last as we approach the end of picking up lost socks - this Laundromat that we passed on the way to Mt Wellington! Gotta run to meet up with the bus so I don't miss our flight! We are going to catch up with Mr Fisher in Brisbane tonight, ready to turn the corner to the homestretch of this tour. 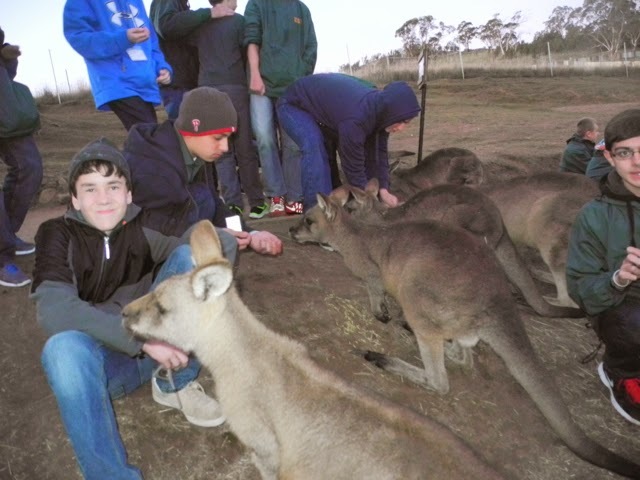 The boys are all having a great trip, and other than a few of the standard tour runny noses, all are well!